With musicians, clergy and actors in my family, Christmas Day was, and remains, a gig for someone. Accordingly, our family celebrations take place in the early afternoon with a spread of finger foods to keep everyone content until all the pros come home. One of Andrew's family traditions which has become a welcome part of the smorgasboard is gougères, a delectable Gruyère cheese puff. 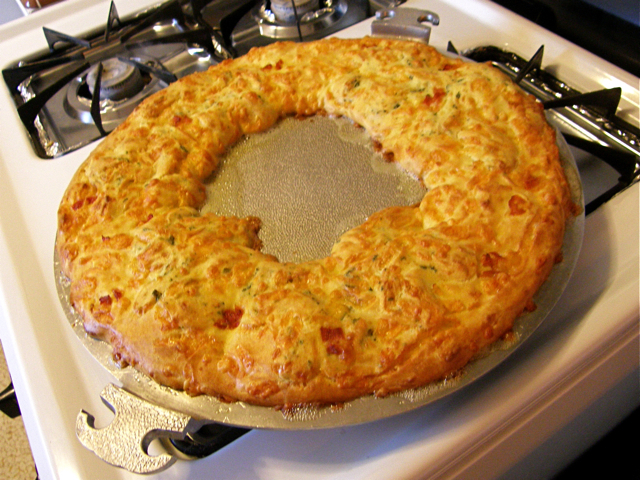 Andrew's mom dollops the cheesy dough into a wreath shape for Christmas. Here, we've adapted her recipe for the Guardian Service 15" round tray, which provides a wide circumference and gives the choux pastry a crisp finish. We've added parsley and roasted red pepper give it a festive "holly and ivy" touch. Preheat oven to 450℉. Butter generously the surface of the 15" round tray. Add tabasco to water and bring to simmer. 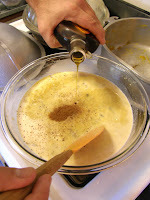 Melt butter in simmering water, bring to boil, then add flour all at once, beating vigorously until the mixture is smooth and pulls away from the sides of the pan to form a ball. Remove from heat and cool slightly. 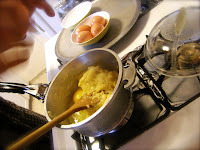 Beat in two eggs, then the remaining, one at a time, until completely absorbed and smooth. When enough egg has been incorporated, the dough will be shiny and pliant enough to fall from the spoon. Fold in the cheese, blending completely (optional: blend in parsley). 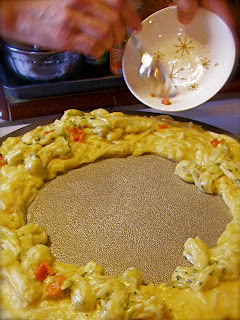 Spoon into a wreath shape on the tray and decorate with roasted pepper. 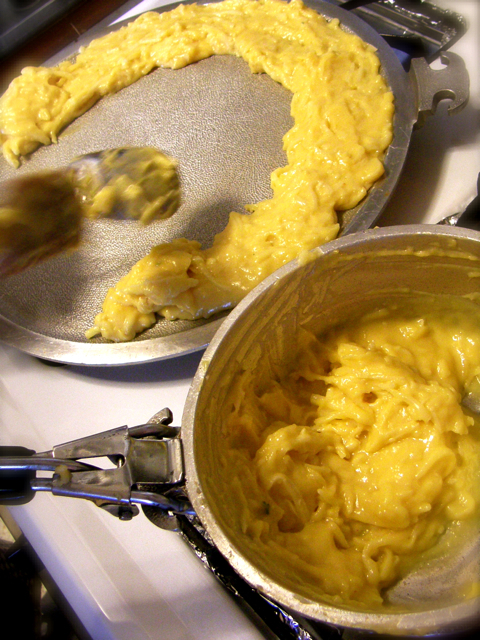 The pastry puffs as it bakes, so butter the surface well and leave plenty of space for it to expand on the tray. Bake at 450℉ for 8 minutes. This quick initial blast of heat makes the dough steam and rise, after which the temperature can be reduced (do not open the oven door during this time). Reduce heat to 350℉ and bake an additional 35 minutes until golden and firm to touch with no moisture present. It may be necessary to prop the oven door open for ten minutes or longer at the end of the cooking time to allow the pastry to further crisp (though be sure there isn't a direct draft, or it can collapse). Remove the gougères from oven, loosen the edges with a spatula, slice and serve (with cream cheese, if you really want to gild the lily). May be made ahead and frozen. 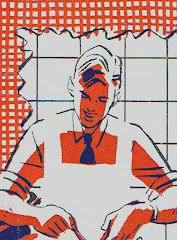 Reheat in a low oven until barely warm. Denver's Brown Palace Butternut Squash Bisque, garnished with salad burnet. As a friend who stopped by to taste this soup remarked, "Oh, that's not good... that's ffffffive–star brilliant." Indeed it is: at the turn of the century, this bisque was served at Denver's Brown Palace Hotel, the first atrium–style hotel ever built and host to the "Unsinkable" Molly Brown, Theodore Roosevelt and Queen Marie of Romania among others. The recipe comes to us through Andrew's mother, Kathi, whose mother and grandmother were among the "Beautiful People of Denver." Andrew, an expert soup chef, has adapted this family favorite to take advantage of our Guardian Service cookware. 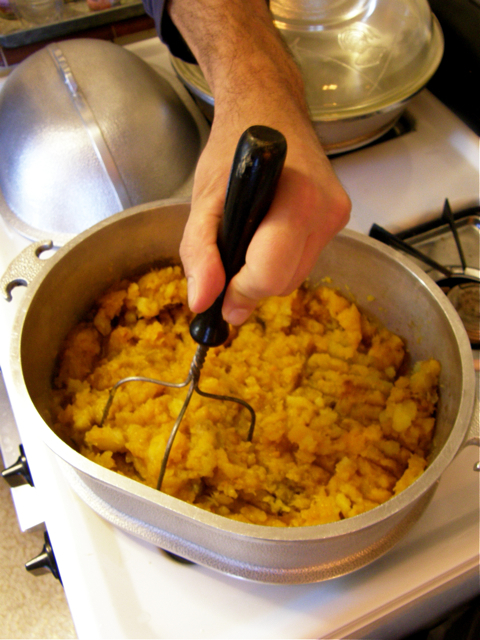 Rather than boil the vegetables, we stove–top roast the squash and potatoes first, then mash. The perfect caramelization of the vegetables adds fantastic depth to an already rich soup. Plus, the waterless technique preserves nutritive value and flavor, helping to make up for this soup's truly staggering Gilded Age dairy fat content. Serve it in small portions... but they'll all want seconds. 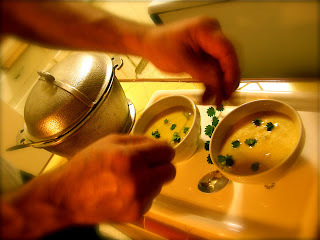 Andrew reminds us: like all soups, this improves over days and freezes beautifully. Plus, it is excellent served chilled. 1 1/2 lbs butternut squash, peeled, seeded. 1) Roast the squash and sweet potatoes the Guardian Way, whole or in chunks, in a large cooker (pictured: the Guardian Service Chicken Roaster) until soft enough to mash with a potato masher. Low heat, about thirty minutes and a bit. 2) Let cool a bit, then mash the sweet potato/squash until smooth. 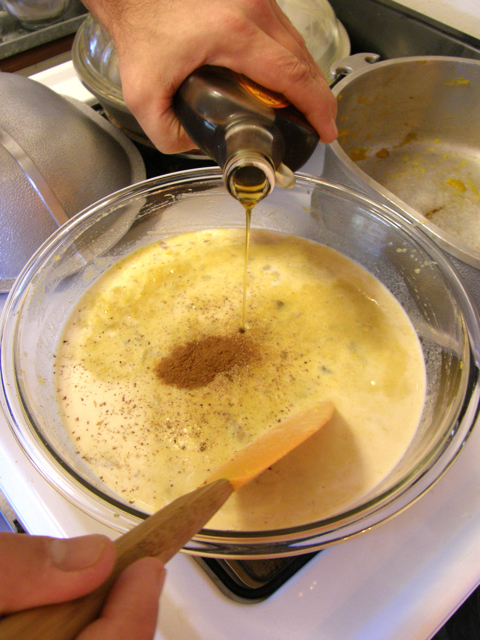 3) In bowl, add milk to the mash, and mix in remaining ingredients, blending until smooth. To give it a nice texture we used an egg-beater, but a blender or food-processor may suit you. 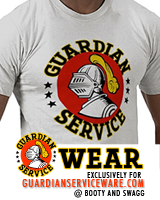 4) Pour into Guardian Service Tureen. 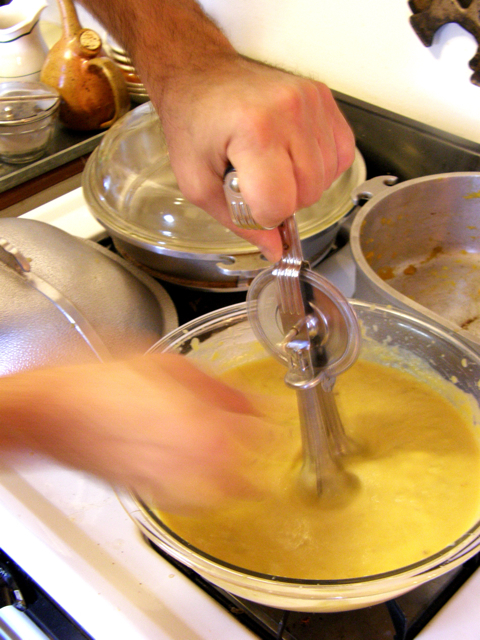 Stirring constantly, bring soup back to a gentle simmer and cook 5 minutes. Salt and pepper to taste. If too thick, add more milk and adjust seasoning. Makes 2.5 quarts.